Rumours are kept up that you are coming to Helsingfors.1 Is it true or not? Then you promised me to come also to Denmark and stay here for some time. Please let me know for sure whether we can expect you or not. I do not know whether it will be good or not for you and for us for you to go here(?) so I will not ask you. There are many things here which you will dislike and disapprove of. And yet Denmark is a sweet and in many ways a good little country. If it be the will of God do come and it will surely be for the best both for us and for India. But you have promised to let me arrange, and to let me know as soon as possible. I am busily engaged in meetings myself and it will be difficult for me to come to Finland with you, but in Denmark you must put yourself in my humble and gentle? Hands(?) so that I can try to protect you against being torn by newspapermen and other rascals. I shall get up the very best men to form a committee to receive you and arrange a few meetings (many or few as you like) and show you the Folk High Schools and farms and whatever you would like to see. For one thing I am sure it would help you to be stronger to go for such a little trip. I am ever so much stronger myself  and better I hope as I promised you to be. It is good for me to be in my old house for some time. And yet I am longing back to India so very badly and remain here only for the sake of India. How are all the friends in the ashram? Please give my love to Ba2 and to Miss Lester(?) and all friends! Or if they do not know Ullerslev in India (it is a telegraphic station though) write Nyborg and it will be sent to me. M. 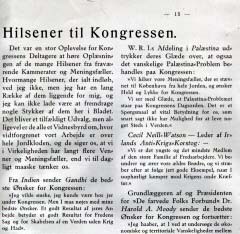 K. Gandhi agter at komme til England, Tyskland, Rusland og Østrig i Aar, Jeg har i Dag telegrafisk afsendt indbydelse til Danmark til ham. Hvem blandt Porto Novo Missionens Venner vil være med til at indbyde ham og afholde Udgifterne ved hans Rejse i Danmark? Skriv snarest til Fru E. Menon, Asylvej 14, Taarbæk pr. Klampenborg, efter første Maj Høvehuset pr. Asnæs (Porto Novo, 1928 no. 3 pp. 22). I am much touched by your kind invitation but I do not see any chance of my being able to go to Denmark in the near future. Gandhi explanes in the article: My apology in Young India, January 31 why he couldn't come to Europe in 1929. Invitation from Dr. Henning Dalsgaard before June 7, 1931. Missing. I thank you for your letter. If I visit London I would love to visit Denmark and other places, but I am not sure when I shall be able to do so. I am sorry to hear about Menon's misfortunes. But Esther ought not to worry about his failure. Please tell her with my love that I expect greater faith and therefore greater pluck from her and please ask her to write to me. I have read with great deal of interest your note at the back of the formal letter from the International Peoples College. You will see from my reply to Prof. Manniche that my going to London itself is problematical and going to Denmark still more so. I would like you to be more explicit about Menon. But now that you have mentioned him I am writing to Esther about his requirements. From: SN 17253; Collected Works, Volume 46, page 351. THE NORWEGIAN UNION FOR LIBERALMINDED CHRISTIANITY WHICH IS WORKING FOR GREATER TOLERANCE IN RELIGIOUS QUESTIONS AND THE NORWEGIAN ORIENTAL SOCIETY REPRESENTED BY PROFESSOR STEN KONOW BEG TO INQUIRE IF YOU ON YOUR JOURNEY IN SCANDINAVIA MIGHT BE WILLING TO PAY A VISIT TO OSLO AND SPEAK IN THE UNIVERSITY FESTIVAL HALL. Having noticed that you intend to visit Scandinavia, we would esteem it a great favour if you could arrange to visit Norway,3 and especially the Norwegian Vegetarian Society should be very glad to have the honour to see you as their guest, hoping also that you kindly would give a lecture on vegetarianism and its influence on human development and culture, in connection with any other subject that you may choose.  All arrangements regarding your visit to Norway our society would be pleased to undertake. We would mention all the same, that a member of our society, a chela of Hindu swamis, had the pleasure to be the man manager of your esteemed friend, the authoress Naidu,4 when she lectured here in Oslo, in February 1920. We can assure you, that your visit to Norway would be looked forward to with the greatest interest. In regard to the great cause, which you are representing, we wish you, dear Sir, success and satisfaction and especially a happy future for India. A short time ago I was asked by Peter Manniche (The International Peoples College of Elsinore) to write and ask you if you during a possible day at the [Round Table Conference] would care to have a few quiet talks with some Danish High School and youth leaders? We also thought you might be interested in paying visits to one or two ordinary peasants homes. However it is first today I have read a wire saying you are coming to Denmark. Because P. Manniche very likely will be in Canada when you arrive I promised him gladly to be at your disposal in order to arrange the things mentioned above, if you so desire. In fact I shall be glad to do any service I possibly can. Mr. Gandhi thanks for the kind telegram from you and other friends of India. At the moment he has to much to do here to make up his plans for the continent. Should he come to Denmark, he hopes to met you. Please accept my cordial thanks for your kind letter. We were very glad to learn that you have not abandoned the idea of coming to Norway, and both here in our country, as well as in Sweden and Denmark we sincerely hope that the plan may be realised. It may be said that the Chr. Michelsen Institute holds a unique international position, as it besides its strictly scientific research work has to work for the promotion of tolerance and forbearance between nations and races, in religious, social, economic and political life, as you will see from the enclosed Statutes of the Institute, pp. 10-11. The Institute (which was inaugurated last year) will try to solve this task i.a. by arranging lectures of such men who have a message to bring our age, and later on to distribute the thoughts of the lecture by publications in different languages. The Institute would now consider it a most important part in its work for tolerance and understanding between races and religions if you would favour it by coming to Bergen as the first lecturer and speak about the religious and ethic ideals which you have given your advocacy by your life and preaching. In this connection I would call your attention to the fact that it is relatively easy to go from London to Bergen, as the crossing with the S/S Venus only takes 20 hours from Newcastle to Bergen. If it on account of the cold time of the year, against our hopes, should be difficult for you to undertake a somewhat longer journey to the Scandinavian countries, I would like to mention the possibility that you might confine yourself to the short crossing here to Bergen, where the climate is somewhat like that of England. If you would give a lecture within the lines of the Chr. Michelsen Institute, this lecture might be broadcasted not only over the Scandinavian countries, but also over the rest of Europe if we could get the necessary information in reasonable time. And in agreement with you and according to your wishes the Institute can afterwards arrange the literary distribution. All expenses in connection with your journey and lecture will of course be covered by the Institute. Official invitation will be sent to you as soon as we get information about the possibility of your coming here. We want to inform you that on the occasion of your 62. Birthday, we have taken the liberty to create you an honorary member of our society as a small token of our sympathy with your work for true manhood. We still hope to see you this autumn in Oslo, and we can assure you, that you Norwegian vegetarian friends would esteem it a great favour, if you could arrange a visit to Norway. If, however, it should be impossible for you to come, we would very much appreciate to receive a short address from you to the vegetarians of Norway, to be published in our magazine. Just before I left London for Denmark, I got this letter from Mrs. Svelmoe Thomsen, the secretary of the Danish Fellowship of Reconciliation and as member of the International People’s College. If you wished so, I could arrange for Mrs. Svelmoe and her group to meet you at the College. If you do intend to go to Copenhagen, her home would be the best for Gandhi and his friends, I should think. Men like Henry T. Hodgkin, Dr. Natanael Beskow (Swedish pastor and pacifist), Mathilda Vrede (Finnish social worker) etc., stay with her and her husband when they are in Denmark. Of course, there may also be others, of whom I don’t know, still better suited to be Gandhi’s host in Copenhagen if he should like to spend one of the three days there. What I do think definitely is that Mrs. Svelmoe probably would be the best possible translator for your book on Gandhi. Source: M[athiasen], O[tto]: Hilsner til Kongressen. In: Aldrig mere Krig, 1937 no. 2. [August] p. 15. Not in Collected Works. 1 Gandhi was invited to the World YMCA Conference in Helsingfors and considered attending it. 3 Stockholm-Oslo-Bergen-Newcastle-London, or vice versa, is a very good route, which we can recommend. 4 Mrs. Sarojini Naidu, poetess and a leader of the Indian freedom movement.